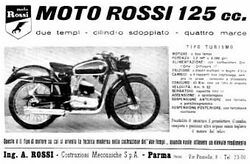 Rossi (Officina Meccanica Paolo Rossi) is a historic brand of motorcycles located in Parma. This Italian company produced in the fifties off-road motorcycles with their own frames and with 123 cc Sachs engines. There was a brand called Rossi (Automobile) and Rossi Varese.